Marcelo Adonay, also known as “Palestrina* of the Philippines,” is regarded as an icon of the golden age of church music in the country and the top representative of church-trained musicians of the Spanish colonial period. 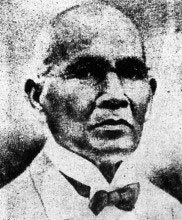 He was born in Pakil, Laguna on February 6, 1848 to parents Mariano Adonay and Prudencia Quiteria, a peasant couple. Because of poverty, he was entrusted to the priests of San Agustin Church in Manila in 1856. It was there that his innate musical talent was discovered and developed and, at the early age of 8 years old, he started learning music. While he apprenticed as sacristan, he learned to play the organ by himself in the choir loft during breaks. Moreover, he also learned and mastered the organ, the violin, the contrabass, and the trumpet by himself. From his humble beginnings as a self-taught musician, he emerged as a composer, conductor, official church organist, maestro di capella or choirmaster of San Agustin Church, and orchestra director. His important works include Liberame, 1869, Benedictus, 1895, Hosana, 1899, Te Deum, and a Grand Mass. As a composer of original Filipino liturgical music, his style is pure and simple. He kept his music in “harmony with the severe regulations of the church liturgy,” while projecting the, “vitality… religious fervor and… Christian faith, hope, love and charity” (Manuel 1955). Among the non-religious pieces he composed is Rizal Glorified which conveyed the heroism and martyrdom of Jose Rizal. It was first played at the Grand Opera House on December 10, 1911. He also taught music at San Sebastian, Santa Rosa, Santa Catalina, La Compañia de Jesus, and at houses of rich families. In 1866, he became a founding member of the Union Artistica Musical, the first musicians’ union in the Philippines. He is well remembered as conductor in the premiere performance in the Philippines of Beethoven’s Missa Solemnis in D Major in 1887. Manuel, E. (1955). Dictionary of Philippine biography. Quezon City : Filipiniana Publications. Mirano, E. (1992). Musika : an essay on the Spanish influence on Philippine music. Manila : Sentrong Pangkultura ng Pilipinas. Mirano, E. (Ed.) (2009). The life & works of Marcelo Adonay. Quezon City : University of the Philippines Press. Tiongson, N. (Ed.) (1994). CCP Encyclopedia of Philippine Art, vol. 6: Philippine Music. Manila : Cultural Center of the Philippines.